Background: Direct sputum smear is still the first-choice tool for screening of tuberculosis worldwide. Variants of this technique, to improve the sensitivity are desired. Methods: Two microbiological variants of the standard sputum smear (”pellet” and “diluted-pellet”) for both Ziehl-Neelsen (ZN) and auramine fluorescence (AF) staining were evaluated. In addition, two methods for concentration of mycobacteria in sputum, using positive and negative pressure filtration, were tested and compared. The evaluation of the microbiological variants was performed on 98 culture positive sputum samples from different TB patients. The diagnostics sensitivity and the level of detritus in the processed sputum were determined. Bacilli load in the smear variants was determined by microscopic observation and by manual inspection of microscopic digital images. The comparison of the mycobacteria filtration methods was performed on 76 smear positive sputum samples. Filters retaining the concentrated mycobacteria were stained with AF and compared with the direct smear. Bacilli load, detritus level, filtered volume, filtration time and background noise level, were determined. Results: The sensitivity of microscopy with the microbiological variants was 7.1% and 2% higher in ZN and AF respectively, compared to direct smear. The sensitivity of AF in diluted pellet was significantly higher than all ZN variants (P < 0.05). Detritus level observed in slides was significantly lower in the diluted pellet than the pellet and direct smear in ZN and AF (P < 0.001). A significant increase in the bacilli load in microscopic observation and digital images analysis was observed in pellet and diluted pellet than the direct method (P <0.0001). 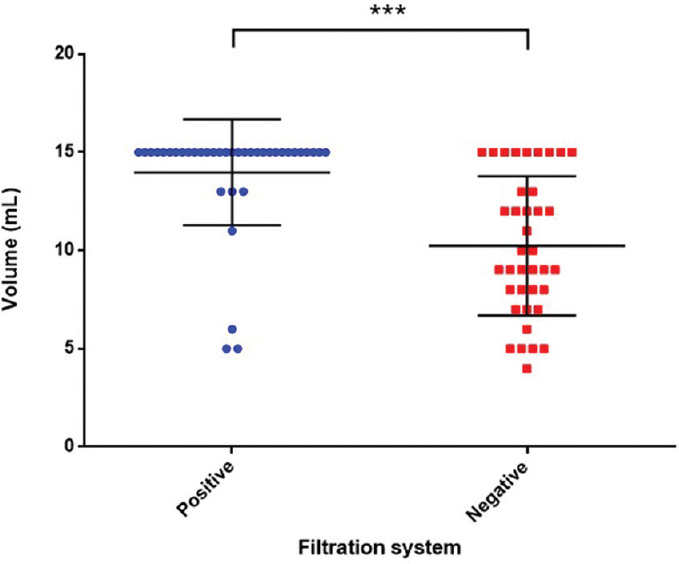 The concentration of mycobacteria using positive-pressure filtration showed a trend to produce a higher bacilli load compared to the negative-pressure filtration and direct smear, although it was not significant. 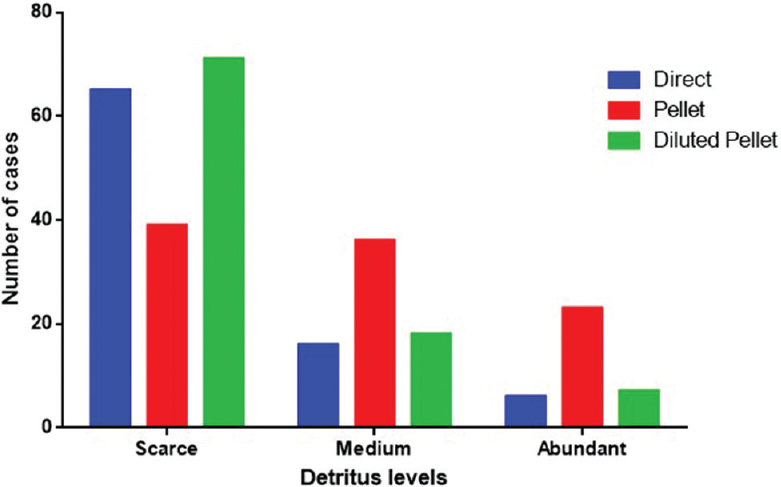 Detritus levels were significantly higher in both variants of filtration (P < 0.0001). Filtered volumes were higher in positive-pressure compared to negative-pressure filtration. Filtration times were significantly higher in negative-pressure compared to positive-pressure filtration (P < 0.0001). Conclusion: The proposed variants improved the performance of the standard sputum smear, making it an important test for settings with high rates of smear-negative TB cases. Mycobacterium tuberculosis (MTB) active infection presents a formidable public health challenge despite being a preventable and curable disease, with now more deaths per year than HIV. The HIV/AIDS pandemic and the emergence of drug-resistance, have precipitated the resurgence of tuberculosis (TB), more severely affecting the developing countries. On average, one-third of the world population is infected with latent TB; therefore, the screening of active TB cases should be as efficient as possible. Given that TB mostly affects the resource-stricken communities of developing countries, the screening should also consider a simple and affordable methodology. The gold standard methods for TB diagnostics are primary culture-based. The slow generational time of around 24 h of MTB, requires for an average of 2–4 weeks for colonies to appear in solid media  or 7–10 days in liquid media culture. Even though many laboratories are adopting rapid diagnostic technologies with automated cultures (i.e., MGIT 960) or molecular tests (i.e., GeneXpert and Genotyping MTBDR Plus), low-resource settings in developing countries with high prevalence of the disease have limited the access to these technologies. Therefore, the lengthy duration of the cultures and the relatively high cost of molecular tests make them prohibitive in these settings. Currently, the direct sputum smear microscopy is the first-choice screening method and has become the indisputable pillar of active TB detection in the developing world. The Ziehl–Neelsen (ZN) staining method is a simple, rapid, and low-cost assay, that is, the first-screening tool worldwide. Despite its advantages, ZN is not very sensitive (30%–70%) in comparison with culture, especially in sputum samples with low-bacterial load commonly found in pediatric and HIV-positive populations. A sputum sample requires 104–105 bacilli per milliliter to be ZN smear positive, which is the reason for its low sensitivity. Comparably, the auramine-fluorescence (AF) smear microscopy has a higher sensitivity (40%–80%) and consumes less time, since it allows for ×400 magnification microscopy inspection, which reduces to 2–3 min the reading time, compared to the 10–15 min in ZN inspected at ×1000 magnification. The recent development of inexpensive, robust, and prolonged lifespan fluorescence microscopes based on the light-emitting diodes motivated the WHO to recommend the auramine smear microscopy as an alternative to ZN., The high workload in TB endemic countries leads to technical fatigue, which reduces the accuracy of microscopy inspection. Therefore, it is important to improve the sensitivity of staining methods and try to make them automatic. In recent studies, microbiological variants of conventional smear microscopy have been proposed to detect the minimal amounts of mycobacteria in sputum, increasing significantly the sensitivity. Added steps, including the centrifugation and treatment of sputum with alkaline chemicals such as NaOH and bleach to liquefy, clarify, and concentrate the sputum samples, have revealed an improved detection of bacilli. In a systematic review, it was shown that centrifugation with the alkaline treatment of sputum is more sensitive than the direct smear, without a compromise of specificity. Otherwise, the majority of studies of studies compare the different alternative methods of sputum concentration at a categorical level that is not very precise to evaluate more precisely the effect of the bacilli load. The detritus, defined as the sputum solid material that can disturb the recognition of the bacilli in ZN or AF; and therefore, influence the result, is not considered either. The reduction of detritus in the ZN and AF slides could improve the smear microscope image quality, and therefore, would considerably favor the development of more accurate algorithms of pattern recognition and automation of smear reading and interpretation. Low amounts of mycobacteria in a positive sample will increment the chance of a false-negative result, and for this reason, the bacilli concentration techniques have been proposed. A novel alternative method of concentration was developed by the filtration of sputum samples using polycarbonate membranes (25 mm in diameter and 1 μm pore). After filtering, the membranes were fixed on a sheet to be held and microscopically observed. This variant was able to increase the sensitivity to 80.2% using fluorescence microscopy. Subsequent evaluations using a negative-pressure filter system with 13-mm diameter filters, showed a significant increase of sensitivity of 89% compared to the direct method (56%) and concentrated by centrifugation (60%). 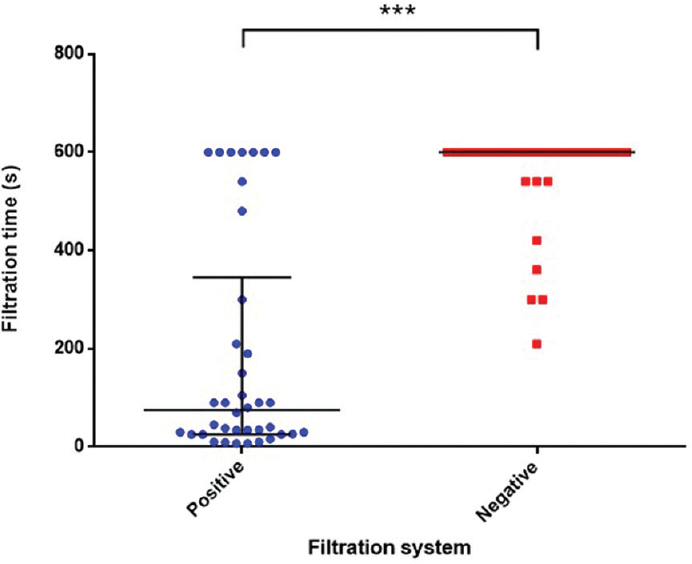 In this study, we evaluated two main variants for the sputum smear: (1) The introduction of two steps in the microbiological processing of the sputum, and (2) the introduction of a step to concentrate the mycobacteria by sputum filtration (testing and comparing a positive-pressure and a negative-pressure filtration method). The study design comprised a total of 214 sputum samples from patients with active TB. In the first part of the study we estimate and compare the sensitivity and level of detritus present in the smear, of the two microbiological variants of sputum processing against direct smear, using ZN and AF staining in 98 samples. Bacilli load was measured for microscopic observation and digital image analysis in 31 and 40 samples respectively. In the second part of the study we evaluated two methods of sputum filtration for enhancing microscopy screening by the concentration of bacilli, in 76 samples. These methods consisted in negative-pressure and positive-pressure filtration. For this, we built and evaluated two mechatronic devices that were compared. 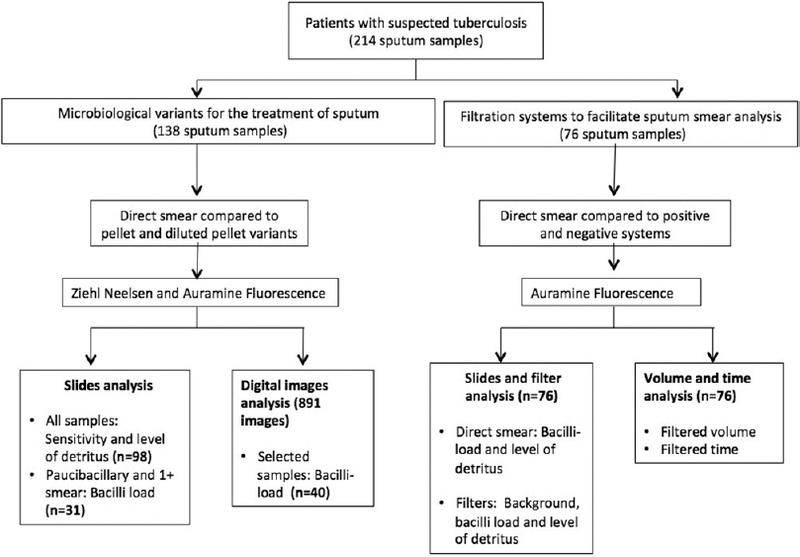 Comparisons between the sputum filtration and the standard direct smear, included bacilli load, detritus level observed, filtered volume, filtration time, and background level [Figure 1]. A total of 214 TB patients were enrolled in the TB Reference Laboratory located at the Dirección de Salud del Callao (DIRESA Callao) after the ethical approval from both Universidad Peruana Cayetano Heredia (UPCH) and DIRESA Callao. Surplus samples from active TB-suspected patients obtained from routine processing with previous smear microscopy readings were reassigned to new codes for this study. All the procedures were performed at UPCH in a level-3 biosafety laboratory. Diluted-pellet – The remaining sediment to the previous step was resuspended in 2 mL of liquid culture medium 7H9-OADC-PANTA. From this resuspension, two smears were prepared. The remaining volume was used to confirm active TB infection by the microscopic observation drug susceptibility (MODS) assay. The six slides obtained from each sample (direct, pellet, and diluted-pellet) were stained through ZN and AF methods. For the analysis of digital images from smears, 40 samples were prepared in a similar way to that indicated above. Digital images were captured from all the stained slides through ZN and AF methods (4-5 images for slide) using a MiniVID USB 5Mp digital camera (LW Scientific) attached to the eyepiece of a Primo star Carl Zeiss microscope. For each slide, we read 100 microscopic fields for ZN, and 40 microscopic fields for AF stained slides. We used ×1000 and ×400 microscopic magnification for ZN and AF staining, respectively. The observed detritus level was manually categorized as scarce, medium, and abundant, by an expert technician in smears interpretation [Figure 2]. The bacillary load in the stained slides was estimated as the total number of bacilli observed in the total surface of the smear previously categorized as paucibacillary and 1+ in direct smear. In ZN, the reading was made in 100 microscopic fields at ×1000 of total magnification, and in AF, in 40 microscopic fields at ×400 of total magnification. Each image was manually examined by the same technician, and the total number of bacilli was counted. Two mechatronic prototypes were designed for the semi-automatic concentration of sputum samples using positive [Figure 3] and negative pressure [Figure 4], respectively. These systems incorporated regulated pressure, filtration time control, and a fluid sensor capable of detecting falling droplets, with which it determines if the filtration process is completed or if the filter is stacked. 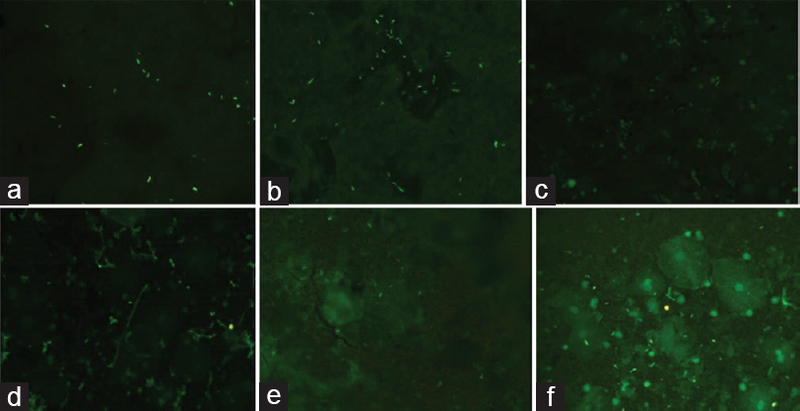 These systems used polycarbonate filters, which after completed the filtration of the total sputum sample, are stained with AF and observed by the fluorescent microscopy. A pilot test was conducted to determine the optimal concentration of NALC and bleach to dissolve the sputum and facilitate the rate of filtering. We used a variation of the protocol proposed by Fennelly et al. For this, a total of 76 sputum samples were processed. Briefly, a drop of the original sample (approximately 40 μL) was spread directly on a slide for staining and conventional microscopic evaluation with AF. Then, 600 μL of the excess sputum was added to a 50 mL Falcon tube and 2.4 mL of NALC solution (10 mg/mL) was added. The tube was vortexed for 10s, followed by 5 min of sedimentation. Six mL of 7% bleach was added, mixed, and allowed to settle for 15 min. Distilled water was added to a total volume of 30 mL. The solution was manually prefiltered using a 30-μm pore nylon filter with a diameter of 25 mm (Millipore). A volume of 15 mL of the prefiltered solution was added to each filtration system that was previously equipped with a black polycarbonate filter of 0.8-μm pore and 25-mm diameter (Sterlitech). Finally, the filters of both systems were removed and placed with the help of tweezers on slides containing a drop of 2% albumin solution and allowed to dry. Then the slides containing the filters were stained with the AF method. The readings of the direct smears and the filters stained with AF were performed in a Primo star UV Carl Zeiss microscope at ×400 total magnification. The total number of bacilli found and the observed detritus in 40 microscopic fields (classified as scarce, regular, and high) were recorded. In addition, the background (observed in previous evaluations in some areas of stained filters) was recorded as scanty, regular or high. Both systems were evaluated in parallel and simultaneously. The filtering volume in mL (approximately 15 mL per system) and the filtering time in seconds were recorded for each process (maximum time per system 600 s). Quantitative comparison among subgroups was carried out according to the normality tests. Dependent samples were analyzed with the Friedman–Wilcoxon tests; independent samples with Kruskal–Wallis test followed by Dunn's post hoc tests. For categorical variables, Chi-squared and Fisher's exact tests were applied. A total of 98 samples, all of them positive to MODS culture were processed through the proposed microbiological variants. Slides readings are summarized in [Table 1]. Of the total of processed slides, 83 (84.7%), 90 (91.8%), and 90 (91.8%) were classified positive in ZN, whereas 92 (93.8%), 94 (95.9%), and 97 (99.0%) in AF using the direct, pellet, and diluted-pellet methods, respectively. Our results indicate that these microbiological variants when compared to direct smear increase the sensitivity of microscopy by 7.1% and 2% in ZN and AF, respectively. Compared to the direct smear with diluted pellet, the sensitivity in AF increases in 5%. Global Chi-square test (for all six categories) showed heterogeneity and post hoc pairwise Fisher exact tests indicated that AF diluted pellet smear sensitivity was statistically significant higher than every ZN stain (P = 0.0003, 0.0348, 0.0348, respectively) although similar to AF direct and AF pellet methods (P = 0.1183, P = 0.365). 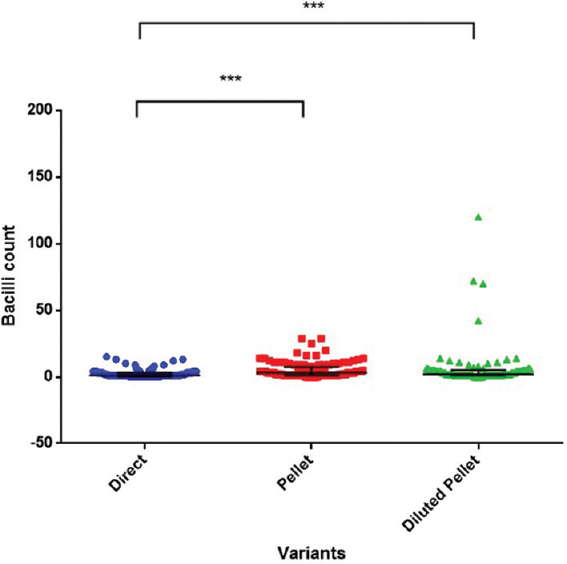 In paucibacillary and +1 smear samples both for ZN and AF, bacilli counts were determined. In samples where 2+ and 3+ were found in all the proposed microbiological variants were not considered. [Table 2]. For ZN, Friedman–Wilcoxon signed rank post hoc tests showed the significant superiority of both diluted-pellet and pellet against direct smear (P = 0.0001); in AF, diluted-pellet was superior to direct smear (P = 0.008). 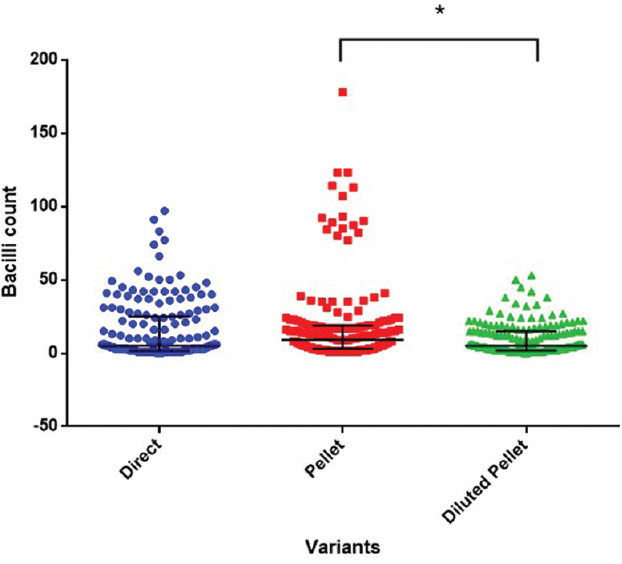 [Figure 2] shows the representative results of the microbiological variants detritus by ZN and AF. The level of detritus in the ZN and AF slides are presented in [Figure 5] and [Figure 6], respectively. For ZN, Kruskal–Wallis and Dunn's post hoc tests showed significant differences in the distribution of detritus as well, with both the direct and pellet methods showing more detritus than the diluted pellet method (P < 0.001). Numerically speaking, detritus levels with the highest number of cases were distributed in the following manner: in the direct group, 44.9% of samples were classified as scarce and also 44.9% as a medium; in the pellet group, 51% of samples as a medium; in the diluted-pellet, 86.5% as scarce. 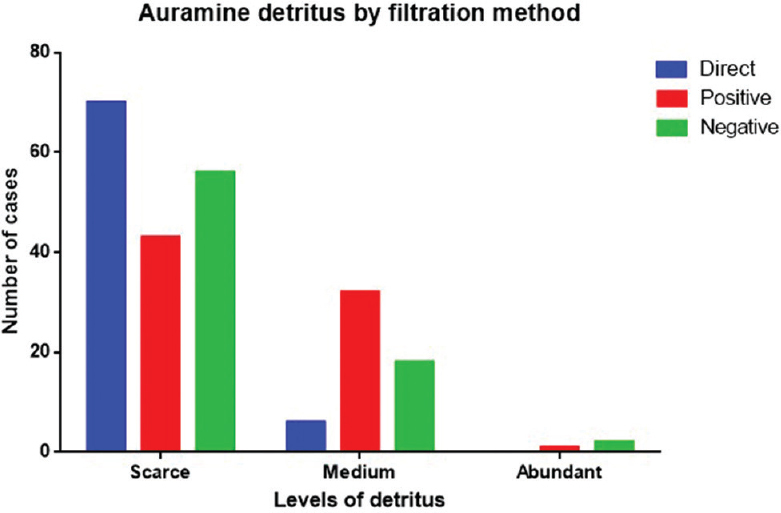 For AF, these tests showed significant differences in the distribution of detritus, with the pellet method having more detritus than both the direct and diluted pellet ones (P < 0.001). The most numerically prevalent classification was “scarce” for all subgroups (direct: 74.7%, pellet: 39%, and diluted-pellet: 71%). A total of 891 images were obtained from the 40 samples processed, of them, 114,117,114 were images in ZN while 183, 180, and 183 in AF using direct, pellet, and diluted-pellet methods, respectively. While in the images observed in ZN [Figure 7] both the pellet and the diluted pellet showed higher counts than the direct method (P < 0.0001) by Kruskal–Wallis and Dunn's post hoc tests. In AF [Figure 8], the pellet method had higher counts than direct smear and diluted pellet (P < 0.0001). Despite the arithmetic superiority of positive pressure filtered samples, Kruskal–Wallis test showed similarity among direct smear (median: 50, interquartile range [IQR]: 4.3–141.5) positive (median: 105.5, IQR: 11.25–320) and negative pressure systems (median: 50, IQR: 4.3–141.5) (P = 0.2033). [Figure 9]a, [Figure 9]b, [Figure 9]c shows the representative images of the level of detritus. Kruskal–Wallis followed by Dunn's post hoc tests showed that detritus levels were significantly higher for both when using positive (P < 0.0001) and negative (P < 0.05) pressures compared with the direct smear. Positive and negative pressures showed a similar distribution of detritus (P > 0.05) [Figure 10]. Numerically speaking, detritus levels with the highest number of cases occurred in the following manner: 92.1% of direct samples were classified as scarce, 56.6% of positive pressure as scarce, and 73.7% of negative pressure samples as scarce. [Figure 9]d, [Figure 9]e, [Figure 9]f shows the representative images of the level of background. Regarding the observed background of filtered samples, the positive system (median 2.0 [1.0–2.0]) presented significantly higher background than the negative system (median 1.0 [1.0–2.0]) (P = 0.0033). Nonparametric Mann–Whitney test showed that positive pressure resulted in significantly (P < 0.0001) higher volumes (median: 15 mL, IQR: 15.0 – 15.0) when compared with negative pressure (median: 9.5 mL, IQR: 7.8 – 13.5) [Figure 11]. Nonparametric Mann–Whitney test showed that positive pressure resulted in significantly (P < 0.0001) faster filtration times (median 75 s, IQR 25.75–345.0) when compared with negative pressure (median 600.0 s, IQR 600.0–600.0) [Figure 12]. Previous studies did not, to our knowledge, compare the sensitivity of of the “pellet” and the “diluted-pellet” microbiological variants of sputum processing, regarding the performance of the direct smear. It is important to highlight that the proposed microbiological variants are implemented with the aim of increasing the detection of TB cases and reducing detritus (debris) as well as other artifacts that could appear as background noise, making the preparation simpler to read for an operator. Therefore, these variants contribute to both increasing the sensitivity and potentially the specificity, facilitating the microscopical observations, and reducing the distracting objects and confusion sources against bacilli. This study is to our knowledge, the first that categorizes the presence of detritus (debris) as a characteristic of sputum smears stained for both ZN and AF. 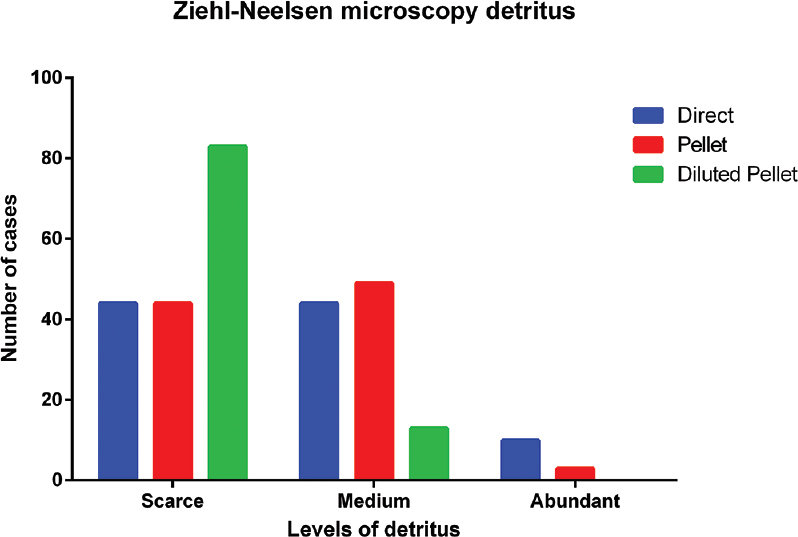 In this study, 77.65% of the analyzed sputum samples were samples were of mucous-like type, where the ZN direct smear and pellet variant presented higher level of detritus than the diluted pellet (P < 0.001). 86.5% of the slides were categorized as scarce for detritus. In AF, a higher level of was found with the pellet variant (P < 0.001) than in other methods. Nevertheless, the scarce category was more frequent in all variants. We believe this could be an effect of the use of potassium permanganate as a counterstaining agent in the last step of the AF staining procedure that produces a dark background, that may hide possible artifacts or detritus present. Similarly, visual analyses were carried out employing photographs, digitally captured with a camera, of 240 slides stained with ZN and AF using the described variants, with the aim of exploring its utility in the development of recognition algorithms. Visually, a higher bacilli load was observed in ZN of pellet and diluted pellet (P < 0.001) compared to the direct smear as well as to the AF. These results are similar to the previous pilot observations (data not shown), where the bacilli load was quantified and detritus was categorized in the images evidencing that less background noise and artifacts were present in the diluted-pellet variant for both staining methods. Our initial findings are being currently evaluated using image recognition algorithms for ZN, where it was found that the best results were obtained with the diluted pellet since it produces cleaner images (less detritus and less complex background) compared with the pellet. With these types of images, an algorithm successfully rejects the objects classified as non-bacilli by a human operator in >90% of cases. Whereas in AF (manuscript in preparation), a higher sensitivity was obtained using pellets or diluted-pellets, in comparison with the direct smears. The diluted-pellet variant also showed better specificity due to a cleaner resultant image. In this study, we designed, built and tested two two mechatronic prototypes for automatic sputum filtering, with with the aim of concentrating mycobacteria. These systems were based on positive and negative pressurization. Our results found that the positive-pressured system was a better system, showing favorable trends of shorter processing times, lower clogging occurrences, and numerical superiority in the bacilli load parameter but without reaching significant differences. Regarding bacilli load or bacilli count, most studies perform comparisons only at a categorical level, which is relevant in a clinical setting, but could be detrimental to the detailed quantification of the effects of new microbiological variants meant to be introduced. This is is the reason why we explored bacilli count in 40 microscopical fields after the direct staining of filters and slides. A possible cause of the low bacillary load in the filters could be associated to the greenish background in some areas of the filters (characteristic not reported in previous studies) that could mask the bacilli, and the greater area of distribution of the bacilli in the filters that may prevent its recognition during the count. The use of sputum concentration systems, by filtration with negative pressure, has been previously studied, confirming the advantages noticed. Other studies used different collecting systems from glass filter holders for manual use, vacuum systems made of plastic , showing improvements when compared with direct smear, but with the limitation of clogging formation in 5%–20% of samples. Other studies however, using multitest aluminum collectors, did not improve significantly the sensitivity compared to the direct smear., In contrast to other studies, here we compare two prototypes of parallel systems (positive pressure and negative pressure) under the similar working conditions with the same volume of samples and measuring the time of filtration and the filtered volume of sample in each equipment. In this study, the sputum filtration method was tested on direct sputum independently of the introduction of the microbiological variants mentioned above, because this could be used as an alternate non-complex method alone. One of the limitations of the filtration method is that, with certain frequency, depending on the degree of viscosity of the sputum, this can become obstructed and generate the need for manual corrections and even potentially loss of samples. In addition, the prolonged time for the pre-treatment of the sample for filtering (approximately 25 minutes) compared to the direct smear. It is important to seek to reduce these events and for that further studies are needed to better liquefy sputum samples, without the introduction of too complex steps. The cost of sputum filtration systems is relatively inexpensive, with the potential to be further reduced in the face of a mass production scenario. This is important to take into account, given the possibility of extending its use in a massive manner accompanied by a system or algorithms that identify the mycobacteria present. The proposed variants increased the sensitivity, reduced debris and cleared the background of the sputum smear, facilitating and improving TB diagnostics, with a potential impact in areas with high rates of smear-negative cases. The authors would like to acknowledge Jose Osada and DIACSA, as well as Jose Oliden and ARIOT, who built the prototypes of the filtering systems for negative and positive pressure, respectively, based on the plans and diagrams we provided. We acknowledge financial support from Círculos de Investigación 1473-2014-C1 CONCYTEC and the Wellcome Trust Intermediate Fellowship (grant 099805/Z/12/Z). World Health Organization. Global Tuberculosis Report. Geneva: World Health Organization; 2018. Available from: http://www.apps.who.int/iris/bitstream/handle/10665/274453/9789241565646-eng.pdf. [Last accessed on 2018 Dec 15]. Sohail M. Tuberculosis: A re-emerging enemy. J Mol Genet Med 2006;2:87-8. Cook GM, Berney M, Gebhard S, Heinemann M, Cox RA, Danilchanka O, et al. Physiology of mycobacteria. Adv Microb Physiol 2009;55:81-182, 318-9. Ghodbane R, Raoult D, Drancourt M. Dramatic reduction of culture time of Mycobacterium tuberculosis. Sci Rep 2014;4:4236. Bishop PJ, Neumann G. The history of the Ziehl-Neelsen stain. Tubercle 1970;51:196-206. Xia H, Song YY, Zhao B, Kam KM, O'Brien RJ, Zhang ZY, et al. Multicentre evaluation of Ziehl-Neelsen and light-emitting diode fluorescence microscopy in China. Int J Tuberc Lung Dis 2013;17:107-12. Hooja S, Pal N, Malhotra B, Goyal S, Kumar V, Vyas L. Comparison of Ziehl Neelsen and Auramine O staining methods on direct and concentrated smears in clinical specimens. Indian J Tuberc 2011;58:72-6. World Health Organization. Framework for Implementing New Tuberculosis Diagnostics. Geneva: World Health Organization; 2010. Available from: https://www.who.int/tb/laboratory/whopolicyframework_july10_revnov10.pdf. [Last accessed on 2018 Dec 15]. Steingart KR, Ng V, Henry M, Hopewell PC, Ramsay A, Cunningham J, et al. Sputum processing methods to improve the sensitivity of smear microscopy for tuberculosis: A systematic review. Lancet Infect Dis 2006;6:664-74. Smithwick RW, Stratigos CB. Acid-fast microscopy on polycarbonate membrane filter sputum sediments. J Clin Microbiol 1981;13:1109-13. Fennelly KP, Morais CG, Hadad DJ, Vinhas S, Dietze R, Palaci M, et al. The small membrane filter method of microscopy to diagnose pulmonary tuberculosis. J Clin Microbiol 2012;50:2096-9. Quincó P, Bührer-Sékula S, Brandão W, Monte R, Souza SL, Saraceni V, et al. Increased sensitivity in the diagnosis of tuberculosis in HIV-positive patients through the small-membrane-filter method of microscopy. J Clin Microbiol 2013;51:2921-5. Boum Y 2nd, Kim S, Orikiriza P, Acuña-Villaorduña C, Vinhas S, Bonnet M, et al. Diagnostic accuracy of the small membrane filtration method for diagnosis of pulmonary tuberculosis in a high-HIV-prevalence setting. J Clin Microbiol 2016;54:1520-7. Jones-López E, Manabe YC, Palaci M, Kayiza C, Armstrong D, Nakiyingi L, et al. Prospective cross-sectional evaluation of the small membrane filtration method for diagnosis of pulmonary tuberculosis. J Clin Microbiol 2014;52:2513-20. UPCH. MODS A User Guide. Universidad Peruana Cayetano Heredia; 2008. Available from: http://www.modsperu.org/MODS_user_guide.pdf. [Last accessed on 2018 Dec 15]. Angeby KA, Alvarado-Gálvez C, Pineda-García L, Hoffner SE. Improved sputum microscopy for a more sensitive diagnosis of pulmonary tuberculosis. Int J Tuberc Lung Dis 2000;4:684-7. Uddin MK, Chowdhury MR, Ahmed S, Rahman MT, Khatun R, van Leth F, et al. Comparison of direct versus concentrated smear microscopy in detection of pulmonary tuberculosis. BMC Res Notes 2013;6:291. Del Carpio C, Dianderas E, Zimic M, Sheen P, Coronel J, Fuentes P, et al. Computer Algorithm for Detection of Tuberculosis Bacilli in Ziehl Nellsen Sputum Smear Images Based on the Adjustment of RGB Primary Component Tones and Geometric Eccentricity. Proceedings of The 21st World Multi-Conference on Systemics, Cybernetics and Informatics (WMSCI 2017); 2017. Available from: http://www.iiis.org/CDs2017/CD2017Summer/papers/SA505WN.pdf. [Last accessed on 2018 Dec 15]. Chew R, Calderón C, Schumacher SG, Sherman JM, Caviedes L, Fuentes P, et al. Evaluation of bleach-sedimentation for sterilising and concentrating Mycobacterium tuberculosis in sputum specimens. BMC Infect Dis 2011;11:269.